It totally hit me today when I stumbled upon a copy of the Tech and an advertisement for Fall Career Fair on the back page. That means an entire year has passed. It’s. Sophomore. Year. Now. Whoa. Thinking about jobs and summer and what I want to do with my life was the last thing on my mind since school started two weeks ago. I had just finished my summer internship, and have only been concerned about settling down and adjusting to my new schedule and new classes (also more on that in a later post!). But as always, everything at MIT seems to runs on its own schedule, and you never really are able to stay on top of everything. The past week has been packed with company info sessions, free food, free t-shirts, networking events, and coffee chats — morning till night. 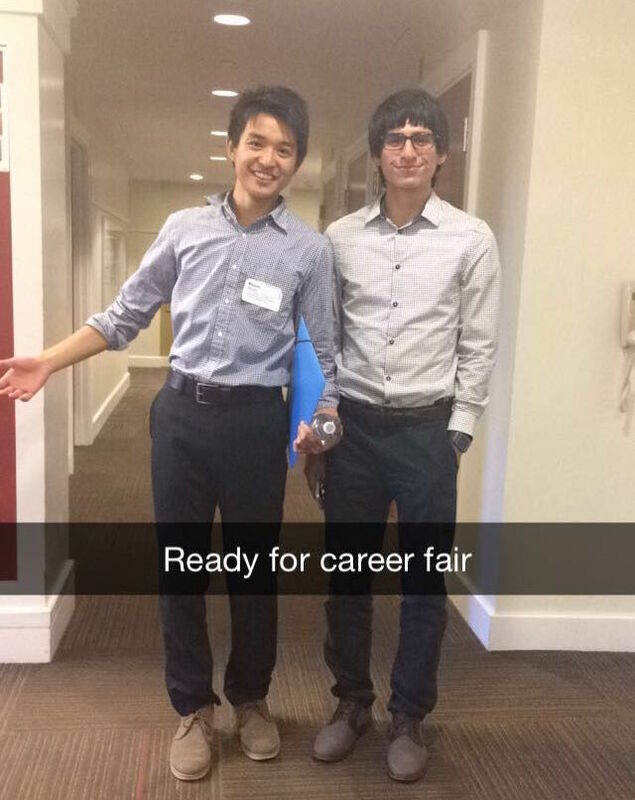 Companies, indeed recruit, early and aggressively, especially around the time of MIT career fairs. One nice part about this year’s career fair is that we do get the day off! Last year I went to the fair in between my morning and afternoon classes, so this year I might actually have some more time to chat with companies and take my time to navigate the enormous maze that’s set up in the Z Center. My friend Luis ’19 and I kind of unintentionally twinned with checkered shirts and blue pants. We’ll see if we end up unintentionally twinning again this year. I also blogged about getting all the free swag here. I don’t think I’ll ever come close to grabbing more than 33 t-shirts in a single day, but who knows? One question I’ve been asked a few times lately, though, is how to format a résumé as a freshman. You’ve just graduated from high school, and you may or may not have a résumé already. So what should you put on your résumé when you have nothing to put on your résumé when companies are looking for what you’ve done on your résumé? I used this as a framework for my new, upgraded, Adult résumé, and fluffed it up a bit. Also, pro tip, as a freshman, since you’re on PNR, you technically could put 5.0/5.0 as your GPA. Up top, I do include my email, phone, and address. Some have asked whether to put your current MIT address or home address. Some put both, but I initally only put my MIT address, and used my home address if I was applying for jobs back home in California. As you will see later, I no longer even include my address as way to keep my résumé clean. 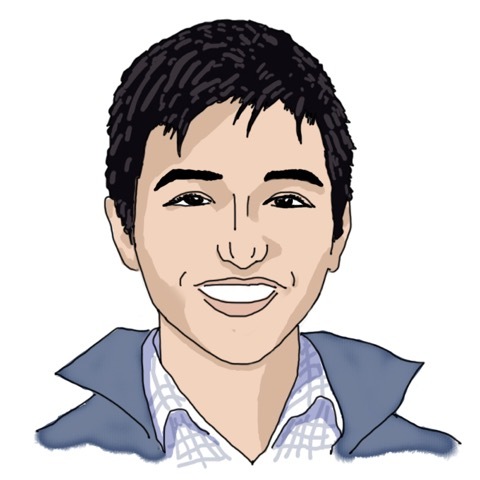 Halfway through the semester, I set up an appointment at the GECD office for a résumé critique — shoutout to Lily Zhang! — and below was the result. Definitely take advantage of the free resources that the GECD offers beyond résumés, like mock interviews, career counseling, or LinkedIn profiles. Throughout the semester, I revised said résumé so many times I lost track. It was a great way to procrastinate on psets, exams, and life. I switched up the fonts from sans-serif to serif, and then back to sans-serif. And each time I would have to re-adjust the margins and layout, because Fonts have different baselines, kerning, and line spacing (throwback to MAS.110 when we spent classes learning about typography), and minds of their own. The result? I have dozens of copies and revisions of different versions of the same résumé. But that doesn’t mean I’ll ever be done tweaking and reformatting the layout, or changing up the font! I’ve been inspired by iOS 10’s new design and am in the process of redoing my résumé (again). Yes, I probably do have better things to work on, but career fair is this Friday, right? Anyway, back to the question about freshmen résumé. Here’s what has worked for me. SIDE NOTE: just do not dump a laundry list of all the activities that you may have done or been involved in at some point, no matter how impressive they may seem to you. You really want to include only the things that matter to you, that you can talk about at length with a recruiter at the fair or during an interview. The way I like to think of it is, if a recruiter or interviewer picked just one thing off your resume to ask about, would that be the best representation of yourself, your skillset and interests, and your biggest, most memorable achievements? Would you be able to talk about that one thing in detail and give concrete examples and narratives of how it reflects your character and personality, and how you would be a good fit as an intern or employee? If not, then take it out. It’s better to have fewer things on your resume that stand out, than to have a laundry list of things that detract from your other, more impressive, experiences. This is the hardest part. Keep it to 1 page max. Once you have paired your résumé down, include a quick summary header, which I like to think of as your “hook.” What is it that you want the recruiters to remember you as, and take away from one quick glance at your résumé? Moving on to, DESIGN. You want your résumé to be aesthetically pleasing and engaging. I made mine on Apple Pages. The first version I did on Google Docs. Others swear by Latex. You can fiddle around with the fonts here, add some color, maybe some lines here and there. Bold some text, italicize some, maybe even underline titles. Just make sure to keep it consistent throughout. Play around with the layout too. 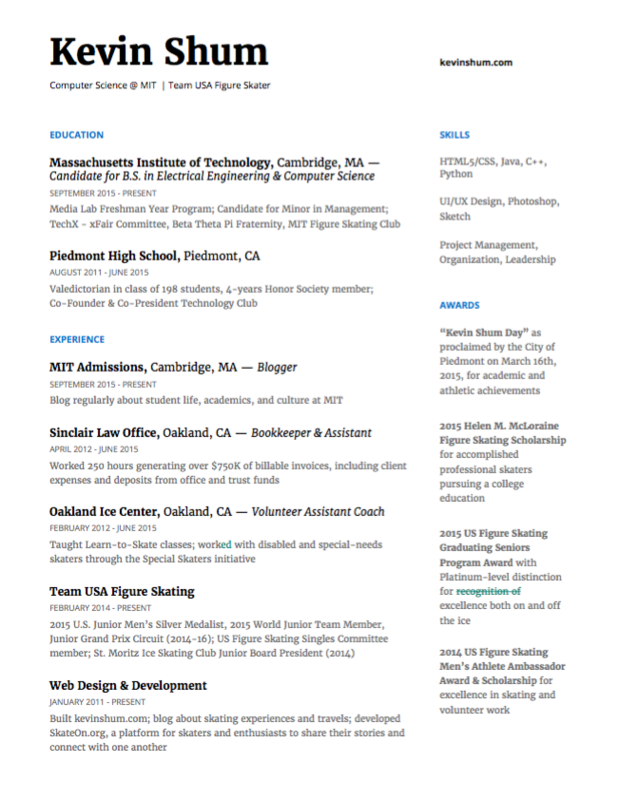 As you saw earlier, I went through dozens of iterations of the design of my résumé (well, that’s also because I’m a perfectionist and design nerd). Finally, ask friends and upperclassmen to look over it. They’ll find mistakes and give you even more pro tips. 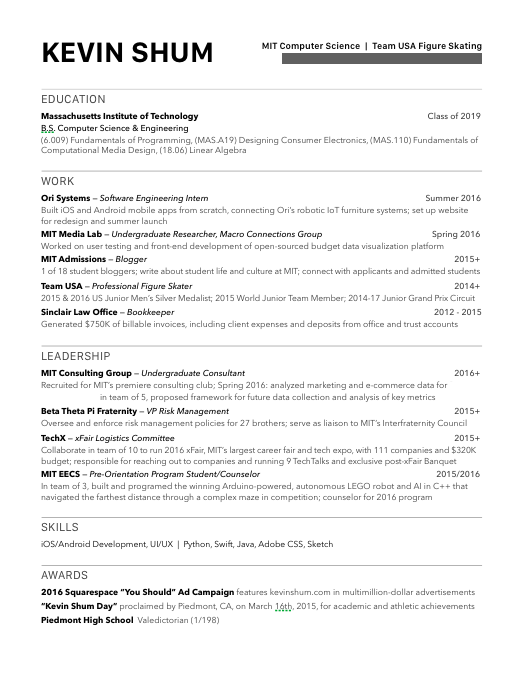 I’ve definitely uploaded my resume for an internship with a glaring typo last fall… oops. Print it out to see how it looks on paper, and proofread every single detail! 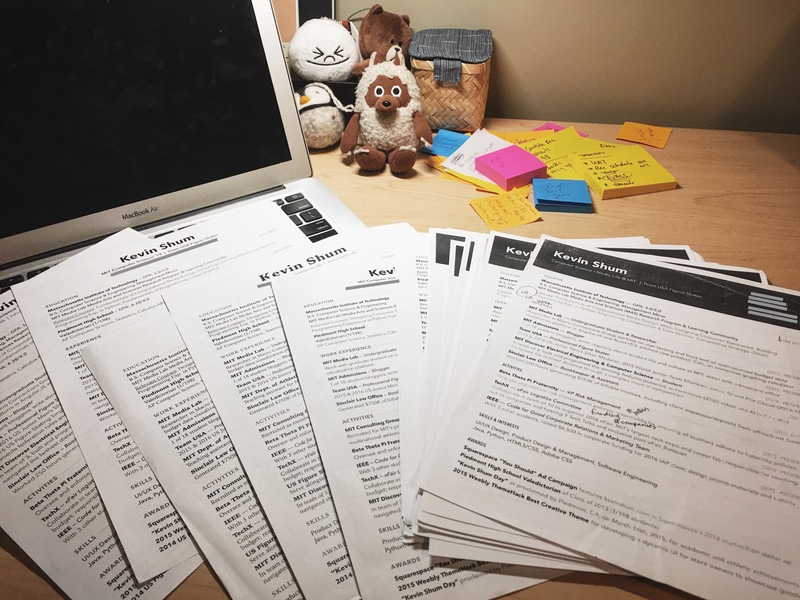 Oh, and a final pro tip, print dozens of copies of your newly-polished and brilliantly-designed resume well before the night before career fair. The printers will be jammed and all the paper will run out at some point, and you’ll have to scramble to find another functional printer somehwere on campus but that won’t be easy because thousands of your fellow classmates will be doing the same because procrastination. Been there, done that. Also, get a sturdy portfolio to hold your résumés in and to collect company fliers and business cards. Keep a pen handy too for notes, too. 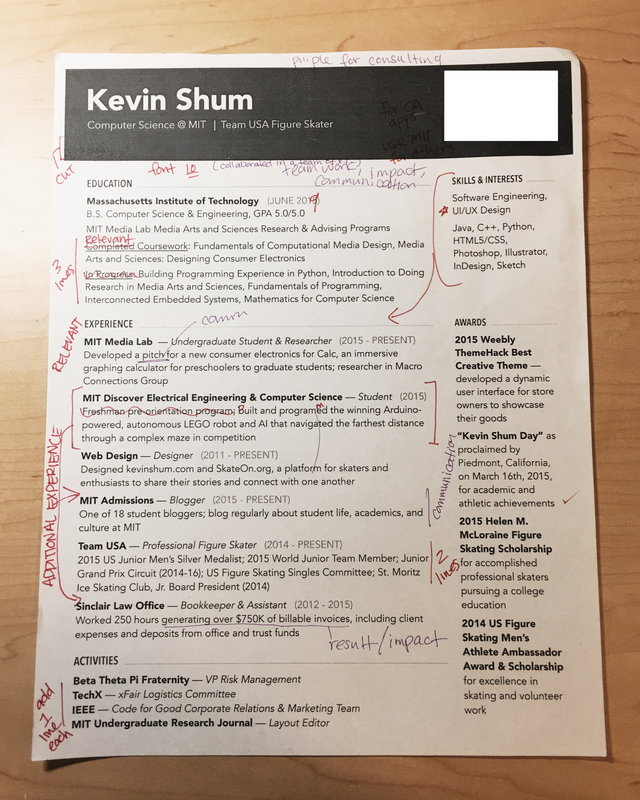 That’s all the tips I can think of off the top of my head, but hopefully that gives you a general overview of what a college freshmen resume can look like! It’s definitely not as daunting as it looks once you get started. And then making it pretty is the fun part and worth looking forward to!